Recently, Inside Out announced the launch of its brand-new Café Originals range, that made its market debut at The Melbourne International Coffee Expo, Feb 7-9th. Inside Out knew that people were increasingly choosing non-dairy alternatives in their coffee, wanting milk which doesn’t compromise on taste, but which is also made the right way, with all natural ingredients. Inside Out’s fresh Café Originals range offers exactly that! Using cold pressed Aussie almonds, this almond milk has a natural taste which combines and stretches perfectly, to allow you to appreciate the full quality of your coffee. Inside Out Café Originals is available in two delicious flavours: Almond milk and an Almond Macadamia blend. 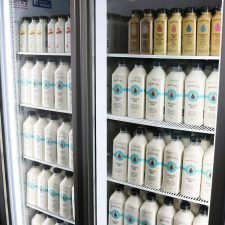 Sales and marketing manager Bex Sanders-Clarke said: “Over the last year, we realised there is a clear gap in the almond milk options available in cafes, with no brands offering a natural tasting product but which can froth, texture, and combine perfectly. Inside Out is well positioned for this task, so our Research and Development team have spent the last few months crafting an almond milk which ticks all the boxes, and tastes exactly like it should be”. Inside Out was founded on doing things the right way, because we respect that you’ve committed to putting our products into your body. That’s why we use only quality ingredients to create our fresh range of milk which will leave you feeling refreshed – Inside and Out.